The delivery of fluoride is accomplished by several methods, one of them is dental restoration, which facilitates the delivery of fluoride directly to the susceptible tooth surfaces. Fluoride may be released from the dental restorative materials, as a part of the setting reaction or it may be added to the formulation with the specific intention of fluoride release. Hence, this study evaluates the fluoride release from the giomer and compomer using different topical fluoride regimes. One polyacid-modified composite resin (Compomer) and one PRG-composite (Giomer) were chosen for this study. Ninety-six specimens (48 of each material) were made by placing the restorative materials into a Teflon mold (5 mm diameter × 2 mm height), supported by a glass slide in a mounting jig. A second glass slide was placed on the top of the Teflon mold in a slot in the jig followed by the tightening of the screw embedded in the vertical arms of the jig, to apply gentle and uniform pressure on the upper slide to extrude the excess material. The top surface of the giomer and compomer specimens were cured using a soft start polymerization unit (Translux® energy, Heraeus Kulzer), with a light exit window of 8 mm and a mean intensity of ≥400 mW/cm 2 , according to the manufacturers' curing times. All specimens were stored in deionized water in air tight plastic containers, at 37 0 C, for three days, to permit a more complete setting prior to beginning the experimental phase of the study. A pH cycling system consisting of a demineralizing solution  (CaCl 2 .2H 2 O- 2.2 mM, NaH 2 PO 4 .2H 2 O - 2.2mM, and CH 3 COOH - 0.05M, pH adjusted with 1 M Potassium hydroxide (KOH) to pH 4.4) and a remineralizing solution  (CaCl 2 .2H 2 O - 1 mM, NaH 2 PO4. 2H 2 O - 1 mM, NaCl - 35 mM, CH 3 COONa.3H 2 O - 15 mM, pH adjusted with 1M Potassium hydroxide (KOH) to pH 7) was used as the suspension medium for storing the individual specimens. Each specimen was stored in a 25 ml plastic container containing 10 ml demineralizing solution at 37°C for six hours, and then transferred to a new plastic container containing 10 ml remineralizing solution at 37°C for 18 hours. Test specimens were subjected to the daily fluoride exposure protocols listed in [Table 1]. Forty-eight specimens of each material were separated into four treatment groups (n = 12) as follows: (1) no fluoride treatment (control);(2) application of a 0.38% w/w Sodium Monofluorophosphate dentifrice (500 ppm F) for one minute once daily; (3) application of a 0.38% w/w Sodium Monofluorophosphate dentifrice (500 ppm F) for one minute twice daily; (4) application of a 0.38% w/w Sodium Monofluorophosphate dentifrice (500 ppm F) for one minute, once daily, plus immersion in a 0.05% w/v Sodium fluoride mouth rinse (225 ppm F) for one minute, immediately following the first dentifrice application. Fluoride treatments were completed at the time of transfer daily for seven days. The media solutions were buffered with equal volumes of Total Ionic Strength Adjustment Buffer (TISAB II). This reagent matches the ionic background of standards to sample & helps to fix the ionic strength at a stable value. By matching the conductivity of both solutions, offsets in readings and measurement errors were eliminated. The fluoride content was measured using the Sartorius Professional Meter PP 25 with a "Combination" ISE (Ion Selective Electrode). For each restorative material / fluoride treatment combination, the mean (± SD) daily fluoride releases in both remineralization and demineralization solutions were calculated. The total daily fluoride release for each specimen was calculated by adding the amount released in the demineralizing solution to that released in the remineralizing solution. Data were analyzed by repeated measures of analysis of variance (ANOVA) and Tukey HSD post hoc tests (α = 0.05), to determine the differences (1) within each treatment group over time and (2) among the four treatment groups during each testing period. The mean (±SD) daily fluoride releases in the demineralizing and remineralizing solutions for each material / fluoride treatment combination are displayed in [Table 2]. Repeated measures of ANOVA revealed statistically significant differences in fluoride treatment effect ( p < 0.0001), immersion media effect ( p < 0.001), and rechargeability ( p < 0.001) for both the materials. Immersion media played an important role in fluoride release for both the materials. Regardless of fluoride treatment, the mean fluoride release for both the materials was significantly greater when immersed in the demineralizing solution than in the remineralizing solution [Table 3]. This was true even though the specimens were suspended in the remineralizing solution three times longer than in the demineralizing solution. The present study revealed a significant difference in the mean daily fluoride release from the giomer and compomer, where the fluoride release was higher in the giomer when compared to the compomer, for all treatment groups. In this study, a pH cycling system, consisting of a demineralizing solution (pH 4.4) and a remineralizing solution (pH 7), was used as the suspension medium for storing the individual specimens and was in accordance with the pH cycling system described by Carvalho et al . According to Featherstone and others, this exposure mimics an in vivo high caries challenge environment. Each specimen was immersed in a plastic container containing 5 ml of demineralizing solution for six hours, and then transferred to a new plastic container containing 5 ml of remineralizing solution for 18 hours. The amount of fluoride released is significantly higher in the demineralizing solution than in the remineralizing solution for all treatment groups of the giomer as well as compomer. Compared to the remineralizing solution, the demineralizing solution appears to have eluted significantly more fluoride from all specimens. This result occurred even though the specimens were immersed in the demineralizing solution for only one-third as long as in the remineralizing solution. The present study's results suggest that increasing fluoride exposure increases fluoride uptake and release by glass ionomer-based restorative materials. Vieira et al . evaluated the effect of fluoride on glass ionomers and resin composites in a simulated high caries environment. They submitted specimens of traditional glass ionomers, resin-modified glass ionomers, polyacid-modified resins, and resin composites to a 14-day demineralization / remineralization regimen, and on Days 8-14, applied a fluoridated dentifrice (1100 ppm) to the specimens, twice daily. Their results suggested that all the materials were capable of absorbing fluoride from the dentifrice solution and later releasing it to the solution. This concurs with the results of the current study. Similarly, this study confirms the findings of Takahashi et al ., who demonstrated that fluoride release by glass ionomer materials increases with exposure to increased fluoride concentration. 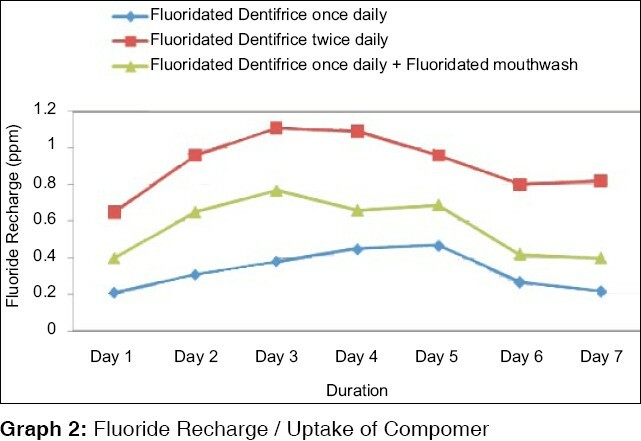 In the current study, fluoride release was significantly greater in the fluoridated dentifrice twice daily group, which received the greatest daily fluoride exposure, followed by fluoridated dentifrice once daily plus fluoridated mouthwash group, followed by fluoridated dentifrice once daily group, and the control group released minimum fluoride. Although the amount of fluoride treatment given was less compared to the study conducted by Freedman et al .,  yet fluoride uptake was observed in the treatment groups. The effects of higher concentration (for example, 5000 ppm) of topical fluorides and increased number of daily exposures may provide an additional insight into this phenomenon. An interesting finding of the present study was the measure of the difference in fluoride release between the control group and other treatment groups. This difference was termed as "fluoride recharge" and was significantly different in the giomer and compomer materials tested [[Graph 1]-[Additional file 1] and [Graph 2]-[Additional file 2]]. 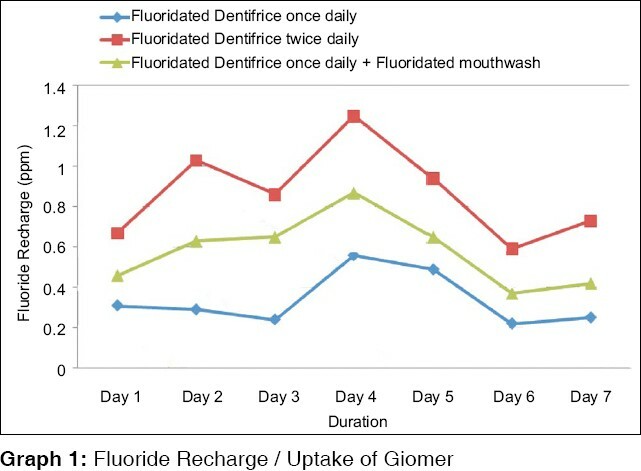 It is worth noting that the fluoride recharge was greater for giomer as compared to compomer groups. It is important to note that although this study was designed to mimic daily occurrences of acid challenges and fluoride exposures seen with typical homecare regimens, in vitro results may not be directly representative of in vivo results. Fluoride release measured from specimens immersed in a static medium may not take into account the dynamic nature of conditions found in the oral cavity. Although the majority of fluoride release studies are designed in this manner, there are some that attempt to more closely simulate intraoral conditions. Longer term studies are needed to evaluate the trend of fluoride release on daily topical fluoride application. Moreover, the effects of additional increases in the number and / or concentrations of daily fluoride exposures should be evaluated. The fluoride release (ppm) was found to be more in the giomer when compared to the compomer. The fluoride released from the giomer and compomer was significantly greater in the acidic demineralizing solution than in the neutral remineralizing solution. It was found that increasing fluoride exposure significantly increased fluoride release from the giomer and compomer. It was found that the fluoride release from the subgroups of Giomer and Compomer was in the following order: fluoridated dentifrice twice daily > fluoridated dentifrice once daily + fluoridated mouthwash > fluoridated dentifrice once daily > control group. It was found that giomer showed comparatively greater fluoride recharge / uptake than the compomer. Within the limitations of this experimental design, definitive conclusions cannot be drawn and further in vivo investigations are needed to evaluate the trend of fluoride release from these materials on exposure to daily fluoride regime under the dynamic nature of conditions found in the oral cavity. 1. Featherstone John DB. The science and practice of caries prevention. J Am Dent Assoc 2000;131:887-99. 2. Koga H, Kameyama A, Matsukubo T, Hirai Y, Takaesu Y. Comparison of short-term in vitro fluoride release and recharge from four different types of pit and fissure sealants. Bull Tokyo Dent Coll 2004;45:173-9. 3. Xu X, Burgess JO. Compressive strength, fluoride release and recharge of fluoride-releasing materials. Biomaterials 2003;24:2451-61. 4. Freedman R, Diefenderfer KE. Effects of daily fluoride exposures on fluoride release by glass ionomer-based restoratives. Oper Dent 2003;28:178-85. 5. Okuyama K, Murata Y, Pereira PN, Migeuz PA, Komatsu H, Sano H. Fluoride release and uptake by various dental materials after fluoride application. Am J Dent 2006;19:123-7. 6. Bogra P, Arora V. Giomer: A new hybrid aesthetic restorative material. J Conserv Dent 2002;5:149-55. 7. Nicholson JW. Polyacid-modified composite resins ("compomers") and their use in clinical dentistry. Dent Mater 2007;23:615-22. 11. Shashikaran ND, SubhaReddy VV, Patil R. Evaluation of fluoride release from teeth after topical application of NaF,SnF2 and APF and antimicrobial activity on mutans streptococci. J Clin Pediatr Dent 2006;30:239-46. 12. Pedrini D, Delbem ACB, Franca JG, Machado TM. Fluoride by restorative materials before and after a topical application of fluoride gel. Pesqui Odontol Bras 2003;17:137-41. 15. Vieira AR, de Souza IP, Modesta A. Fluoride uptake and release by composites and glass ionomers in a high caries challenge situation. Am J Dent 1999;12:14-8. 16. Preston AJ, Agalamanyi EA, Higham SM, Mair LH. The recharge of esthetic dental restorative materials with fluoride in-vitro- two years' results. Dent Mater 2003;19:32-7. 17. Forsten L. Fluoride release and uptake by glass ionomers. Scand J Dent Res 1991;99:241-5. 18. Takahashi K, Emilson CG, Birkhed D. Fluoride release in-vitro from various glass ionomer cements and resin composites after exposure to NaF solutions. Dent Mater 1993;9:350-4. 19. Young A, von der Fehr FR, Sonju T, Nordbo H. Fluoride release and uptake in vitro from a composite resin and two orthodontic adhesives. Acta Odontol Scand 1996;54:223-8. Tiwari, S. and Nandlal, B.